July 2012 Happy Canada Day everyone! I hope your summer is progressing well. The weather has been great. Were you able to get out to see the Dunnville Mudcat Parade on June 9th? For the first time in many years it rained, but it didn’t dampen spirits. The streets were lined with excited spectators and the parade itself was well attended by numerous organizations and businesses in Dunnville. Our float was absolutely beautiful. Director Pamela Blanchard outdid herself this year. With an army of volunteers she organized the clean up, painting and decorating of the float before parade day. On parade day we had a great turnout of members and directors and we looked awesome in our green DHS t-shirts and aprons. Thank you to all who helped out by riding on the float and walking along the route handing out seed packets. There are pictures posted on our website so please go to www.dunnvillehortsoc.gardenontario.org to see them. The June Rose and Flower show unfortunately had to be cancelled. June turned out to be much busier than we anticipated, so we are now focusing on our September Flower and Vegetable show. You don’t have to be an expert to enter an exhibit. We’ll have more information for you in August. The June 21st garden walk at the home of Beth Powell was absolutely amazing. She has over 15 acres of rustic country gardens with plenty of whimsy and xeriscaping perennials. Beth was the most gracious of hostesses, and I certainly hope we get to visit her garden again soon. Earlier in the year we announced that DHS is having a photography contest that will be judged at the November meeting. There are 4 categories for pictures: Winter, Spring, Summer and Fall. Pictures must focus on “the garden” but can include pets and children/people. You are allowed to enter 1 photograph in each category and there is no cost to enter. Please keep the contest in mind as your are out and about taking pictures. You don’t have to be an expert so don’t be shy–this will be a great opportunity to show off your garden and your photography skills. There is a list of upcoming events on our website so don’t forget to check periodically for updates. There is also a list of events on the Ontario Horticultural Association’s website at www.gardenontario.org. Please visit their website for updates, and for more information on how the association functions. The Dunnville Horticultural Society is a member of the Ontario Horticultural Association. The OHA is divided into 19 districts, with DHS being in District 9 which is comprised of the Town of Haldimand, Niagara North (Lincoln), and Niagara South (Welland). From time to time we hear of exciting things that are going on outside of our area, one such event being the NATIONAL GARDEN FESTIVAL in Buffalo, NY. It’s a five-week-long garden party, with 14 garden walks and tours (including America’s largest – Garden Walk Buffalo), bus tours, weekday Open Gardens, speakers, workshops and a Front Yard Garden Competition. This festival of 1,000 gardens has something for anyone with – or without –a green thumb! This is the 3rd annual festival, running from June 23 to July 29, 2012. Our upcoming guest speaker for July is coming to us from the Ministry of Natural Resources to talk to us about invasive species. Every year we hear about new invasive plants and animals so this will be a chance to get up to date information. This meeting, as all our meetings are, is open to the general public. Please plan to attend and by all means bring a friend. Everyone is welcome. 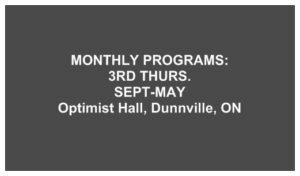 See you at the next General Meeting on July 19th at the Dunnville Optimist Hall. Meeting was opened by Judy Jeffery at 7:10 p.m. with a warm welcome to our members and guests. She introduced the head table and announced the assignment of Lori Maracle as our Vice President. It was a full house. There were 43 members present and 22 guests bringing the total to 65. Refreshments were served at the start of the meeting. Pazzo Pizza donated 5 large slab pizzas, Tim Hortons donated 200 Timbits and Maura Cooper, Janice Croft, Rob Maracle and Kim Christoff added to the table as well. Minutes: May’s minutes were distributed and read. There were no errors, omissions or questions. Ian moved to have the minutes accepted, Hellen Edyl seconded the motion and the motion was carried. 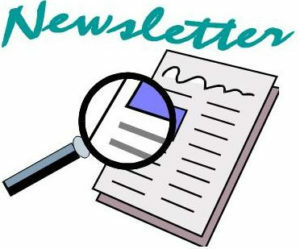 Treasurer’s report for June was posted with the LCD projector for all to follow along while Kim Christoff read the report. There were no errors or omissions. Mudcat Parade Lori Maracle gave a recap of the parade and what fun it was. Pam Blanchard and Janice Croft were thanked for the many hours they put in decorating the wagon. The owner of the wagon, Eric Hunter was thanked as well. Trillium Award Program Lori gave an update on the Awards. The entries have now been tabulated and the winners will be announced shortly. It will go in the papers as well as having a letter delivered to each winner. We will be holding a special Awards ceremony in their honour at our September meeting where they will receive their awards. The papers and some local dignitaries have been invited. Garden Walk Judy talked about the success of this year’s garden walk to Beth Powell’s which was followed by a BBQ at Judy’s. It was a great evening for all. 2012 BOARD OF DIRECTORS It was put to the members that they should consider running for the board. Elections and the installation is held in November which gives people time to think about it and find out more. Flower and Vegetable Show Judy told everyone that the show will be held on Saturday September 22 at the Optimist Hall. It is open to all members with several different categories. More information will be handed out at the August meeting and will be posted on the website. WAYS AND MEANS was held by Betty Ballanger. $57.75 was raised. Meeting adjourned by Judy at 9:10 p.m.